The Downeaster is scheduled to expand service beyond Portland to Freeport and Brunswick in November. 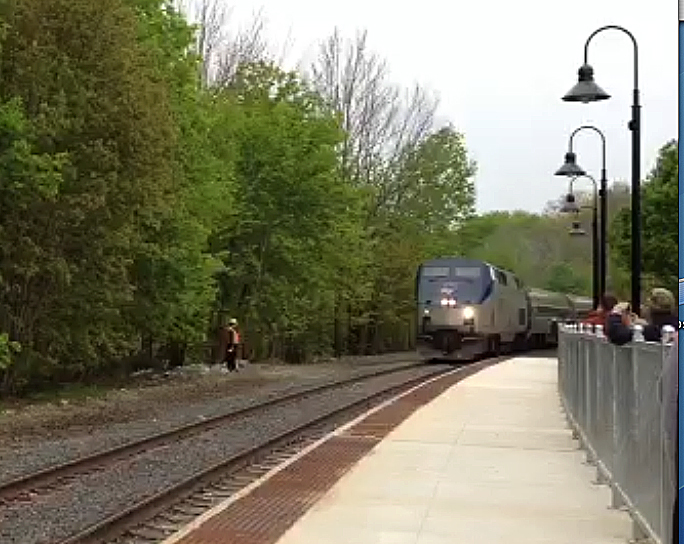 FREEPORT — Federal, state and local transportation officlals gathered in Freeport today to mark the completion of a passenger platform that will serve the Amtrak Downeaster when it begins service to the town in the fall. The Downeaster, which delivered dignitaries to the event, is scheduled to expand service beyond Portland to Freeport and Brunswick in November. This morning’s celebration followed 12 years of planning for an expansion project that’s expected to promote business, tourism and more energy-efficient travel. The Northern New England Passenger Rail Authority, which manages the Downeaster, received a $38.3 million federal economic recovery grant in 2010 to upgrade 28 miles of rail line. A similar event was held today at the new Brunswick platform. The Downeaster now runs from Portland to Boston with stops in Maine, New Hampshire and Massachusetts. Since the service began in 2001, the Downeaster has transported more than 4 million passengers.